A suite is seen at the Mirante do Arvrao hostel in Vidigal favela, in Rio de Janeiro, Brazil, April 5, 2016. Stunning views of iconic Sugarloaf Mountain, a sun-drenched patio nestled in the hills of Atlantic rainforest and rooms costing a fraction of nearby hotels. The Favelinha hostel, like others in several of Rio's more than 1,000 shantytowns, offers more than just cheap housing for the more adventurous among the estimated 500,000 foreign tourists expected to arrive for the Olympics in August. The establishments also open the rich culture of the city's slums for travelers, giving them a glimpse into one-time "no-go" areas where about one-fifth of Rio's population lives. A guest relaxes with the The Sugar Loaf mountain in the background at Pousada Favelinha (Little favela) hostel in Pereira da Silva favela, in Rio de Janeiro, Brazil, April 29, 2016. French tourist Sabrina Noblanc took selfies with a friend on the deck of the Favelinha hostel in the Pereira da Silva slum, or "favela," located in central Rio on a steep hill, where the city's traffic din fades away to the squawks of jungle birds and squeals of kite-flying kids. Noblanc arrived in Rio with the notion that all the city's shantytowns were centers of heavily armed gangs and drug trade violence. "Now that I'm here, I am impressed," she said. "It's better than my imagination. For me, it was to be so dangerous, with the guns and everything. Actually, that's not the case." Without question, the majority of Rio's slums suffer from intense violence. What critics call heavy-handed policing, coupled with drug factions fighting among themselves for territory, leads to daily shootings and deaths. Brazil, according to United Nations' statistics, has more gun deaths than any other country. Rio's state government implemented a program in 2008 to "pacify" slums by pushing the gangs out of areas mostly located near richer neighborhoods or Olympic venues. But the effort has had mixed results and is losing steam because the security budget was slashed this year amid Brazil's economic crisis. Solange, a worker at Pousada Favelinha (Little favela) hostel, prepares a room in Pereira da Silva favela, in Rio de Janeiro, Brazil, April 21, 2016. Solange dos Santos manages the Favelinha hostel, where the daily rate for a double bed room is about $30, compared with $250 at nearby three-star hotels. 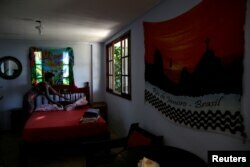 "It is difficult to establish a hostel inside a favela, with everything that we know goes on in favelas," she said. "But that is changing because people are coming and interacting with the people, and saying, 'Wow, this isn't anything like what we've heard about!' There is peace and tranquility here."